Backless choli is in vogue and season's hottest trend trend. Bollywood actresses from Aishwarya to Madhuri to Sonam to Deepika are spotted in backless choli paired with lehenga, skirt or hot saree to add that extra glam. 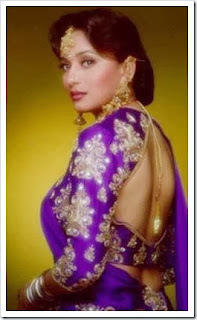 The trend of backless blouse or choli is popular both on and off screen. Beautiful Madhuri Dixit end after Backless cholis after the movie “Hum Aapke Hain Koun”. She proved how a traditional outfit saree one of the most sexiest and glamorous outfit of modern times. Many actresses followed the trend including Priyanka chopra in her desi avatar song called “Desi girl” where she wore a gold saree with knotted backless blouse. Bollywood celebs make a hot statement with their backless choli blouse paired with a gorgeous saree. Even so-delicate chiffon sarees teamed with a backless choli makes it head turn on and off screen. Cbazaar offers a wide range of blouses for daily, casual and party wear. Cbazaar offers attires that reflect a perfect mix of creativity, aesthetic design and comfort. Cbazaar offers a wide range of Indian attires, Bollywood clothes, wedding clothes for men, women and kids online. Cbazaar is one of the leading online apparel stores for weddings and red carpet events. Check out their new collection which is a perfect blend of modern and traditional designer attires. Sunny Leone: The First Bollywood Celebrity To Have Walked The NYFW Runway!!! Prapti Bagga is a Freelance Fashion Consultant, Bollywood Blogger and Social Media Marketer based out in New York. She loves Music, travel, Shopping, Reading Cards and believes in living life to its fullest.